You have probably thought about starting your own vegetable garden and we encourage you to go for it. It is such a rewarding project as you will enjoy your first harvest in a very short time. Of course, there are things to know before starting or even planning your vegetable garden. There are many tips that will help you throughout the whole process. If you are a beginner in vegetable gardening it is best to choose edibles that are easy to grow. Some of the best choices are lettuce, tomato, sugar snap peas, beans, radish, summer squash, rhubarb, chives, basil, thyme etc. But, we advice you to start small. This means planting just as much as you need. You don’t want to end up wasting food and feeling overwhelmed by your garden. Think about what your family eats. Also, have in mind that some veggies keep providing throughout the whole season while others produce only once. Planning is the key for a successful vegetable garden. Ok, so you have chosen what to plant. Now it is time to determine how much space you need and of course, to choose the perfect location for your vegetable garden. It should have enough sunlight, to be near a water source and to be protected from wind and frost. When you have chosen the perfect location you should decide how to make the most of the space you have. Again, go small, you don’t need much space to begin with. In fact, you can successfully grow edibles in containers on your deck or balcony so obviously you don’t need too much space. If you tend your garden well it will produce more than a much bigger weed filled garden. It is simple – large garden requires much more time to be maintained. If you are an experienced gardener and have enough time to take care of a large garden we encourage you to go for it. But if you are too busy to spend a lot of time in your garden or are a beginner we recommend smaller edible garden or even raised beds as a much better choice. There are two ways to plant the layout of your garden. The first is traditional row planting which is the most common vegetable garden layout. You simply place plants single file in rows, with a walking path between each row. Although row cropping sounds logical and easy, this approach is suitable for large vegetable gardens only. And with the fact that we are having less and less garden space a different approach is more suitable. Intensive cropping reduces the space needed for a vegetable garden. It involves using wide bands. By dividing the garden into small beds will allow you to mix different kinds of vegetables even if your garden is small. 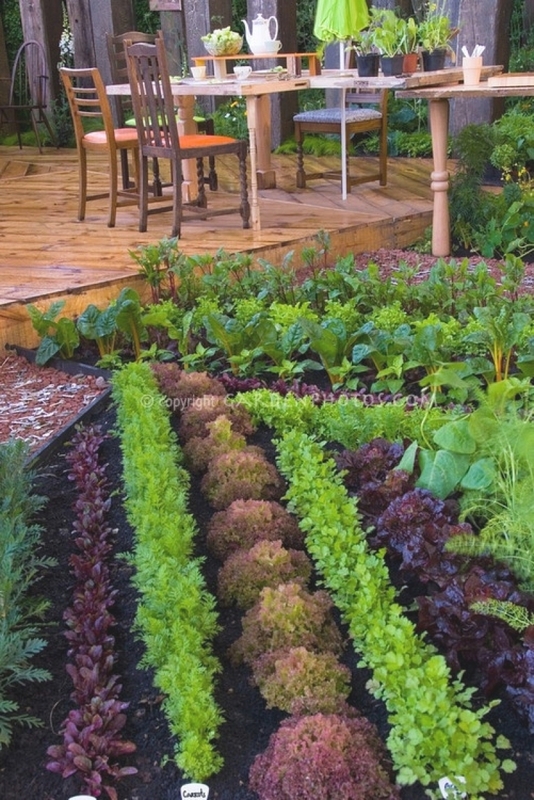 In both cases, raised beds or open beds you will actually be able to downsize the garden. There are many reasons for choosing an intensive garden system over rows. It requires less effort, less soil complication etc. We recommend using the three-year crop rotation system which means planting the same crop in the same place only once every three years. This way you ensure that the same garden vegetables will not deplete the same nutrients year after year and will also help foil any insect pests or disease pathogens that might be lurking in the soil after the crop is harvested. To implement this system you will need to make a paper plan. It will show the location of all plants during each growing season, so that you know exactly what you were growing and where. If your garden hasn’t been planted before, your vegetables will do great the first year. However, in the next one you will have to prepare the soil for good results. Simply add some good organic matter to the soil. It is always best to test the soil prior planting your edibles. Determine the pH of the soil by using a soil test kit. Acidic soils, or soils with low pH can be sweetened by adding lime while alkaline soils with high pH need gardener’s sulphur and rich organic matter and should be mulched with acidic materials such as pine needles and forest duff. Don’t forget to check soil drainage as well. You can do this by soaking the soil with a hose, waiting a day, then digging up a handful of soil. Squeeze the soil hard. If water streams out, you’ll probably want to add compost or organic matter to improve the drainage. Grow your own seedlings indoor in late winter so they are ready to be planted when the weather is warm enough. This goes for veggies like tomatoes, peppers, and eggplant that need a warm growing season to produce harvest. You can also start cool-season crops, such as broccoli and cabbage indoors so they will be ready to transplant into the garden in early spring or fall. To start the seeds fill 4 inch containers with a potting mix. Moister it and let it dry then plant the seed according to the package instructions. Moist the soil lightly and don’t forget to put a label with the plant’s name. When the seeds germinate, move the pots into an area with bright light and temperatures between 60°F and 75°F. Transplant to individual pots when their second set of true leaves develops. Water immediately, and then set the pots in bright light. Use fertilizer sold for starting seeds to feed your seedlings on weekly basis. Traditional summer crops such as snap beans, corn, cucumbers, melons, peppers, tomatoes, and squash should be planted after the last frost in spring. If you plant them early make sure you give them a proper protection. As their name says these veggies like warm soil and high temperature and will be killed by winter frosts. With warm-season crops it is usually the fruit that is the edible part instead of their leaves or roots and they can be stored for winter consumption. Other warm-season crops are edamame, eggplant, okra, zucchini, watermelon, herbs etc. Cold-season crops or winter vegetables prefer cooler climate and grow best at temperatures averaging 15° cooler than those needed by warm season types. Usually they have edible roots and leaves, while a few produce edible seeds. These veggies should should be grown to maturity in cool weather. You can plant them in early spring or in late summer. Cool-season vegetables include: beets, broccoli, Brussels sprouts, cabbage, carrots, cauliflower, celery, kale, lettuce, onions, peas, potatoes, radishes, spinach and many more. Most of them can tolerate short periods of frost. When your vegetable garden is all done the real work starts and that is taking proper care of it. The most important part of maintaining your veggie garden is watering. Provide about an inch of water per week or less if there is enough rain. There is a rule that will help you – always check the top inch of the soil. If it is dry then you should water your garden. Raised beds need more watering then in-ground crops. Water them every other day. Weeding is another important aspect. Make sure you keep them on minimum by stirring the top inch of soil regularly to discourage their seedlings. With larger plants mulch, plastic and compost can help with weeds. As we already mentioned adding fertilizer is necessary for a rich harvest. Use high quality compost or packaged vegetable fertilizer. Don’t over do it as too much fertilizer can have a negative effect on your crop. If you have planned, planted and maintained your vegetable garden as needed, you can expect a successful harvest. Harvesting is done in several stages, depending on the vegetable variety. It is best to take a basket and collect everything that is ripened on daily basis. On time harvesting will make your veggies produce more. Some vegetables are better to be harvested while they are still small. Zucchini are an example – when they are longer than 7 inches they become tough and woody. As we said planning is everything when vegetable gardens are in question so keep track of what you have planted and follow the package instructions. Check the seed packet to know what to expect of each crop. Harvesting is also the perfect time to look for diseases or pests so you can get rid of them.